When we talk of ‘normal’ facial appearance, we imply that there is a ‘normal’ balance to the features of the face – particularly the nose, chin and cheek bones. If one of these features is out of proportion with the others, a face can look out unusual especially to someone who is aesthetically sensitive. It is understandable that a person can feel self-conscious if a feature of his or her face is out of proportion; either too large or too small. This section deals with chins which either jut out too much or are too recessive and cheek-bones which are too flat. For other individuals, they dislike the prominence of the angle of the jaw at the back on each side – this can be reduced (gonioplasty) and, for example, is a common component of male to female transgender surgery. Be wary of general cosmetic surgeons who only seem to have one operative solution for your chin or cheekbones – an implant out of a packet! We still routinely see such poorly researched stories from journalists today such as this BBC article where only implants are discussed. Repositioning your own chin bone is more logical and acceptable to many patients. It is important that your surgeon is both trained and experienced in assessing your whole face – it may be possible that the position of your chin is related to the jaw as a whole being too large or too small such that your teeth do not meet properly. If so, you should get advice from your dentist, as you may need an operation following additional assessment by both a facial surgery specialist and an orthodontist to adjust the position of your teeth and then reposition the whole of your jaw. If this were to be the case, this more major operation (a mandibular osteotomy) would be required rather than the type of treatments which are described here. Disproportion of the nose can be addressed by a ‘Rhinoplasty’ operation and may need to be considered when balancing the chin / cheekbone proportions. Chin: Medical digital photographs and plain x-rays (radiographs) may be taken in sideways (lateral profile), frontal views of the jaws / chin along with an x-ray to assess the roots of your teeth and position of the main nerve to the chin / lips. Cheekbones: Medical digital photographs will be taken. Plain x-rays may be taken to assess. 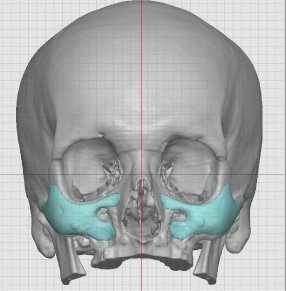 Custom implants or complex cases may require a CT (computer tomographic) scan of the jaw(s) / cheekbones and may require 3D virtual surgery planning. If the cut is made inside the lower lip, there will be no visible scar. If it is made underneath the chin, the scar should be difficult to see during social contact in the line of a natural crease. There is always some swelling (at it’s greatest at 2-3 days after surgery) and sometimes bruising which usually settles within three weeks. Temporary numbness or reduced feeling of the lower lip, chin and gums after chin surgery and of the upper lip, gums and the side of the nose after surgery on the cheeks is common. It usually disappears within a few days though you may have a period of pins-and-needles sensation during recovery. For chin bone movements, these are held in place with small titanium plates and screws shaped and fitted by hand by Mr Andi. For the great majority of cases, the patient would be unaware that they are present. There is chance – about 5% – over the years after the operation of having to have them removed. Mr Andi usually fixes an implant in place with one or more titanium screws. If this is deemed unnecessary, an implant, particularly when it used to build out the chin, may not become firmly fixed to the underlying bone and feel a bit unstable. However, this is unlikely to have any effect on your appearance. Sometimes though, the outline of the implant’s shape can be visible under the skin. Because there may be some scarring in the muscles of the chin as a result of surgery, you may find that your chin creases differently when you smile. It is usually possible to harmonise the facial features with one or more of these operations. However, as the outcome of treatment must be an appearance with which you feel happy, it is helpful if you have a clear idea in your mind about what is wrong with your present appearance and that you can explain this to Mr Andi. Mr Andi will be able to give his expert personal opinion as a dedicated facial specialist about the changes that could be made for the better. However, in the end, it is your face and how you see it that is most important. Once you have established together the ideal solution for you, Mr Andi will be in the position to advise you on the possibilities of achieving what is agreed together in the consultation. There is a small risk that part or all of lip &/or chin may be numb, have an altered or tingling sensation and proportion of these may be permanent. There is an equally small risk of some weakness in one or more muscles around the mouth. Occasionally, the pressure of an implant can thin the underlying bone and, if roots of teeth are nearby, they may be weakened. Sometimes an implant can slip out of place and require a further operation to reposition it – this is less likely when the implant has been fixed in place. Occasionally, these operations are complicated by infection which shows up as a painful, red swelling and it may be necessary to remove an implant/bone graft in order to clear it up. Should this be necessary, a new implant/graft can usually be replaced once the infection has cleared up. Horizontal changes: A jutting chin can be reduced by removing some of the chin-bone (a horizontal reduction genioplasty) / sliding the chin backwards (sliding genioplasty); a recessive chin can be built out either by sliding the chin forwards (sliding genioplasty) or by inserting an implant on the bone (alloplastic implant genioplasty augmentation). Vertical changes: a small chin can be augmented by moving some of the chin bone downwards and inserting a bone graft to stabilise the position (an augmentaiton genioplasty with autogenous bone graft) or by inserting an implant – which may have to be custom made for this purpose (custom alloplastic chin implant augmentation). A tall chin can be reduced by removing some of the chin bone – usually by way of a wedge resection (a vertical reduction genioplasty). Combined changes: a customised combination of the above procedures is often necessary given the 3 dimensional requirements for the individual case. Each of these operations is carried out through a cut made inside the mouth in the groove between the lower lip and the gum. Although, if an implant is used, the surgeon may advise that the cut is made in the natural crease underneath the chin – this position minimises any visible scarring. A prominent ‘angle’ of the jaw (the lower border at the back corner of your jawline) can also be reduced (gonioplasty). In some patients, it is sufficient for prominent chewing muscles (masseters) at this location to be reduced in size with botulinum toxin injections repeated at 4 month intervals. If the bony contour is too prominent, then surgery can be performed via an incision concealed within the mouth. Planning CT scans are required for this surgery and the degree of safe reduction may be limited by your anatomy. Flat cheek- bones can be built out by inserting implants over the cheek bones usually through cuts that are made inside the mouth where the cheek joins the upper gum. Again it is important that your facial surgeon is trained and experienced in assessing your face as to whether cheek bone augmentation is indeed the best option, rather than surgical movements of the cheek bones / upper jaw / both jaws to gain the best facial balance. If your informed choice is implants, those which Mr Andi prefers to use are purpose-made and shaped from medical polyethylene and have been widely used in craniofacial surgery for many years. For most patients, pre-shaped, sterile packaged variable sized implants are well-suited and can be adjusted to fit well to the individual patient’s bone. They may be retained in place with titanium screws. For rare complex patients – for example in cases with asymmetry – it can be appropriate and possible to have custom-fit implants individually made based on an acrylic model of your own facial skeleton made from a 3D computer tomographic scan of your face. Sometimes it is necessary to use a bone graft in augmentation cases, which may be taken from the back of your lower jaw within the mouth. In some cases it is necessary to use the crest of the hip as a donor site for the bone graft and this would leave a noticeable scar. Commercial particulate bone material is an alternative in some cases an can spare the need for a bone graft harvest site. Chin and cheekbone operations can usually be done at the same time as other facial cosmetic surgery, such as a face lift (rhytidoplasty) or an operation to reshape the nose (rhinoplasty). Because of the risk of infection, it is most important that your mouth is healthy and that there is no infection in your teeth. You are strongly advised to visit your dental practitioner for a check-up if you have any doubts. If you smoke tobacco, try to avoid smoking for at least 1 day before the operation. This is because the toxic elements of the smoke have a powerful effect to impair your own ‘defence’ cells whose job it is to deal with bacteria. These defence cells help to further reduce the small risk of infection in the site of surgery. Secondly, your red blood cells will have better oxygen-carrying ability during your general anaesthetic. What can I expect at the time of the operation? These operations are usually done under a general anaesthetic for which you would need to be in hospital at least overnight. Immediately after the surgery, the area will feel numb because local anaesthetic will have been injected and will last for 3-6 hours. Thereafter, you can expect a mild-moderate amount of pain for the first two days and some soreness inside your mouth where the stitches lie. Generally, only paracetamol is required as a painkiller after this surgery. If you have had surgery to your chin, you are likely to have it strapped with an adhesive tape chin dressing overnight. The most important thing to do is to treat your face gently and avoid disturbing an implant by feeling it or, worse still, trying to feel if it will move. Don’t rest your chin on your hand. Keep your mouth clean and have a mouthwash morning, after meals and at night (at least 3 times a day) whilst your stitches are dissolving. You can make your own warm salt water mouthwash: put a heaped teaspoon of salt into a mug, add boiled water, then let it cool down to a comfortable temperature before rinsing and spitting out. When brushing your teeth, you should take care not to damage your scars with your toothbrush – purchase a ‘baby’ toothbrush which is smaller to allow minimal displacement of your lip near the wounds for the first 10 days. If you smoke tobacco, try to avoid smoking for at least 2 days after the operation for the same reasons outlined above. You may need at least a week off work.